On Saturday, March 31st, 2012 I received this e-mail: Bob; Just checking out your website and came across the record book stripers. I belong to Marin rod and gun club in California. 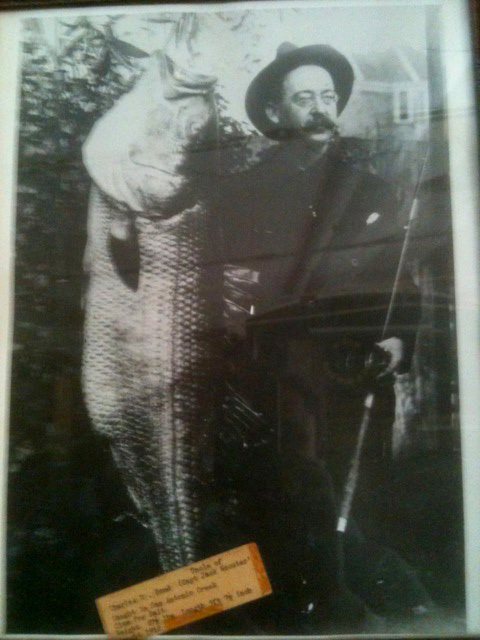 For as long as all the old time club members can remember , an old photo of a man with a huge striper has hung on the club wall. Perhaps since 1927 when the club opened. 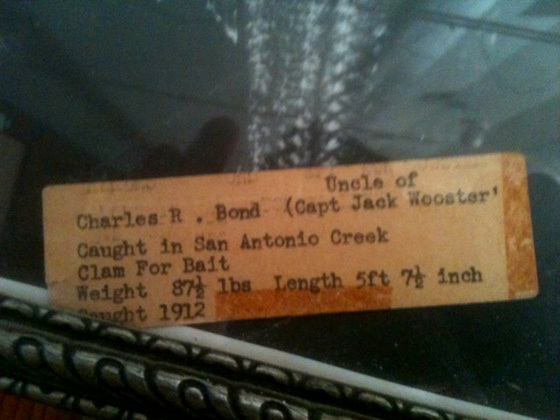 The photo reads "Charles Bond, striped bass 87.5 lbs, 5'7" long, San Antonio creek, clams for bait". If interested I could forward a photo. On April 6th, Brent sent me the photo, shown above, and also the photo shown below. Also from Brent: San Antonia creek is a tributary of San Francisco Bay. It's on the border of Marin and Sonoma counties in Novato California. Also from Brent: I don't know how a person goes about verifying something like this for official records but I'm convinced it's a no b.s. Photo. I first saw it on the wall 30 years ago. I know it's been up for many more years than that. I'm sorry the photo is not high quality, I took a pic with my iPhone of the wall photo. Note: This could very well be true. Consider that in 1879, 132 fingerling striped bass were introduced into the San Francisco Bay, after surviving a long train ride across the US from the Navesink River in NJ.